The seagrass habitat of the endangered Okinawa dugong is safe from the U.S. Department of Defense, at least for the next 90 days. The sea mammal, cousin to the Florida manatee, will continue to swim in Henoko Bay off the Japanese island of Okinawa in the place where the United States plans to build an airbase. A federal judge in San Francisco Wednesday ruled that the Department of Defense, DOD, is in violation of the National Historic Preservation Act for failing to consider the impacts of a new airbase on the dugong in order to avoid or mitigate any harm. The act requires agencies of the U.S. government to consider the impacts on cultural and historic resources in other nations when undertaking activities outside the United States. The dugong is classified as vulnerable by the IUCN-World Conservation Union due to habitat destruction and degradation, as well as human exploitation. 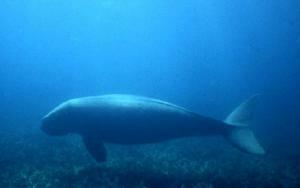 The Japan Ministry of the Environment recently listed the dugong as critically endangered in Japan. U.S. Marine Corps Air Station Futenma is located in Ginowan City on Okinawa, and due to social and economic changes, is now completely surrounded by urban development. Both the Marines and the Japanese want the facility moved out of the city. Local residents voted against the base in a referendum, but Japanese and U.S. authorities have paid scant attention to the vote. DOD plans call for construction of the Futenma Replacement Facility, FRF, about two miles offshore on reclaimed land. The location is in Henoko Bay and squarely in the midst of dugong habitat. While the DOD must gather information and present it to the court, the case is not yet decided. The judge wrote, "this case is held in abeyance until the information necessary for evaluating the effects of the FRF on the dugong is generated, and until defendants take the information into account for the purpose of avoiding or mitigating adverse effects to the dugong."